Will Facebook Graph Search Affect the Way We Search? TAMPA, FLORIDA-I’ve watched and read with great interest over the past month the news about Facebook CEO Mark Zuckerberg’s announcement regarding Facebook Graph Search. It immediately piqued my curiosity about whether this new social media search mechanism would have search engine optimization implications. I’d love to tell you I’m an early adopter of Facebook Graph. Alas, I dragged my feet and just realized in mid-February you have to join the waiting list of hopefuls looking to try Graph Search Beta. So as I wait, I comb the Internet to see what others are saying, and to offer some professional opinions about what I think this could mean for SEO companies and clients who always are in pursuit of the best search rankings. First, a definition: Graph Search is a new service Facebook is rolling out that enables users to search their social connections for information. The search results are based on information shared by your friends and other Facebook users. You can watch an online demo of how it works at this Google Hangout by Josh Bachynski. The Facebook team has posted some helpful information to educate us on the powers of Graph Search. In a nutshell, they say it will enable us to find specific information easily. For example, let’s say you’ve planned a trip to Portland. Graph Search will allow you to find your friends who live there so you can pop in for a visit while you’re in town. Here’s an example Lans Rasmussen, engineering director at Facebook, gave that I love because so many of our clients here at Millionairium are in the dental field: you can search for “what dentist do my friends like?” and get a list of dentists’ Facebook pages that have been liked by your friends. Let’s think about why this is valuable. In my community, there are some local business sites that offer review opportunities in addition to Google Plus, Yelp, Angie’s List, etc. Many local business owners (me included) encourage people to leave reviews because we believe they’re valuable, particularly on Google Plus. But whose opinions do we really value? Where do we go for advice most frequently? Our friends and family members. And where are we connecting with those people? Facebook, of course. So it makes sense to me that more people will turn to Facebook for those research and referral needs in the near future as Graph Search becomes more popular. For business owners, I believe – and Saeed Khosravi agrees with me – Graph Search means it is more important than ever that you have a Facebook page for your business and you ask your clients and customers to like your page. Of course, it takes more than simply having a page to get your followers engaged. For help with that, check out our previous posts about how Facebook can help your business and watch this video about SEO and social media marketing. This doesn’t sit well with me. It smells like gaming the system. I’m a purist who believes your personal page is best for friends and family, and your business page is for current and potential customers, clients, fans, etc. I think you should be aboveboard and create a page for your business instead of trying to make your business look like a person. Here’s where Bachynski and I agree once more: he says Graph Search will generate results based on data that is completed on these personal accounts and pages, and the more friends and likes you have, the greater the chance that your personal account or page will appear in pertinent Graph Search results. Fill in as much information as you can about your business and naturally use your keywords wherever possible in that information. Get people to like your page. Update your page frequently by adding photographs, links, comments, etc. I’ll use my business Facebook page as an example. I’ve entered information into the About section that describes what I do and includes keywords, lists my address and office hours, and lists three Place Sub-categories (the maximum allowed). This year I’ve really focused on placing content on my page and the Insights section reflects the fruits of my labor. 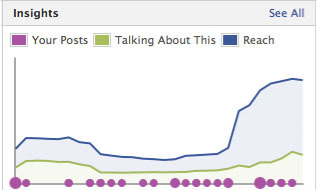 My reach has increased 800 percent since mid-January. People like my posts, share them on their own pages, and leave comments. Just as Google likes websites that appear to be alive and kicking, I think Facebook personal accounts and pages that have high activity levels will rank higher in Graph Search. I’m practicing what I preach in hope that I can report back to you in a few weeks with proof that it works. Getting likes for your Facebook page is similar to and as crucial as getting backlinks for your website. Using keywords wherever you can on your Facebook page is like on-page optimization. Being active on your page is like updating your site with new content. “I think Facebook Graph Search is going to play a crucial role for businesses with local scope since the results that it retrieves can be tailored based on where you live,” he says. There is one characteristic that sets Graph Search apart from Web search, Saeed says. Web search helps you discover the information you are looking for on the Word Wide Web, but Graph Search enables you to explore the information that is shared on Facebook. This means you can find out what other people are interested in, or get advice on different things based on the people you are already connected to or might be interested in connecting to. Will Graph Search become so important that SEO companies start tracking it in addition to Google and Bing? Reading this article gave me many things to think about with Facebook Graph Search. You have some quality information here that any reader would enjoy. I share many of your views in this article. It is a big challenge for Google, They have beaten Yahoo and Bing; but now they are facing a very powerful opponent that is targeting their strength point, If they want to stay in business they have to use their users to humanize the search results but it looks like Goggle relies on it\’s algorithm more than it\’s users and this is where Facebook strikes. This site is very interesting and useful information on SEO. I really like the Facebook graphsearch, hoping it will be official soon. May be they way we search the web gradually change in future, nice article.